Just the other night I sat on a bar stool in my kitchen as I watched my children and husband make homemade ravioli. I pitched in here and there but mostly I observed. It went something like this. The first batch of dough didn’t turn out right so they laughed and tried again. Then over and over they ran it through the pasta squishier thing (I’m sure there is a technical term). Soon (actually it took a long time) they had a counter full of flat pasta dough and they started making filling and pressing out square raviolis. It’d taken so long that the laughter wasn’t as strong as it had been and an occasional murmur was heard, but overall they were still a congenial crowd. Finally the Ravioli were boiled and we all sat down to eat them. All through the meal the kids kept saying how great they were. They loved them!!! Start to finish it was a three hour process. One of the thoughts I had while watching my little crew work together was that it wasn’t so different from writing a book. I start out eager. Ideas, plot twists and new characters just begging to be written. Then as I dive in I start to wonder if I’ll ever finish. I also find myself wondering if it’ll be worth it. There are steps along the way that seem tedious and never-ending. But I just keep going. The moment the ravioli was on the table and the first bites were taken was perfect! The moment a book finally goes into print too. 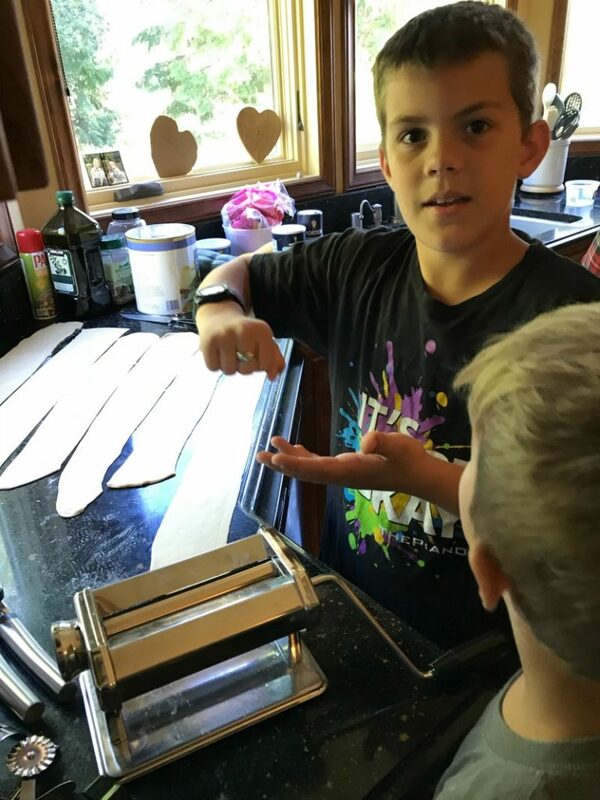 The kids look back on ravioli night with fondness and despite the long process of book publication I find myself feeling pretty proud that I trudged through the hard parts to get to the end. I guess it goes to show that hard work does pay off. What hard things have you stuck with when you felt like quitting? Get instant access to The 6 Love Languages of Writing. That’s really great that your family made pasta from scratch, together!! I think the last thing I quit was trying to crochet a blanket. I changed it to a scarf. A blanket to a scarf! Great idea. Valentine’s Day Event and Giveaway!